When I first announced the artists that would be part of my Class of 2013, I basically promised that it would be even better than my Class of 2012. You could say that I had high hopes for all of these ten artists, and much to my chagrin, they actually delivered this year. There was plenty of action to be found, and plenty of profiles raised to new heights of popularity and stardom. It’s amazing to think that not only did virtually everyone improve their stature in the music world, but about half of them released full lengths that made my Top 50 Albums of 2013 list, not to mention many others’. In short, I’m exceptionally proud of the work all of these artists did over the last year, and invite you to join me now for a quick recap of what they did across 2013. And just like that, we’ve reached the end of our Top 50 Albums countdown journey. It’s been interesting and a whole lot of fun to put together, and I sincerely hope that you’ve enjoyed this and the other Listmas entries that have helped to wrap up 2013 and start 2014. This has extended far later than I wanted it to go, and all the delays are due to a variety of factors that I don’t care to get into, but at this point I’m just glad we made it. Thank you for bearing with me, and I hope we can still be friends after this. In case you missed anything from this year’s Listmas, let me give you a quick rundown and direct links to the many posts that took over the site in December and this early part of January. It’s been a lot of fun so far, and there’s a lot more fun still on the way. In today’s set, you’ll find a few psychedelic and experimental pop records, along with small touches of electronica and hip hop. Join me after the jump for #20-11. I hope you enjoy them! We’ve now reached the halfway point of this Top 50 Albums of 2013 countdown. In case you missed them, here are links to Part I [#50-41] and Part II [#40-31]. Let me just say that this third part may be the most interesting section of the entire list. I don’t mean to put any other of the sets of ten to shame, but there are just so many oddities and flight of fancy records here that I suspect you may have missed at least a couple of them this year. There’s a lot more obvious stuff as we get towards the finish line, and some relatively popular indie records came before this, so this is the gooey middle where anything goes. We’re talking weird electronica, neo-classical post-rock and gothic drones among the fare you’ll find below. It wasn’t planned this way, I just wrote the Top 50 list and it worked out like this. So please enjoy this bit of strange after the jump, as we continue to forge onward chronicling the year’s best records! My life is a comedy or errors sometimes. You set aside 10 hours to write most of your Top 50 Albums entries, and then somehow come down with food poisoning, which eliminates that window entirely. What are the chances, right? Well, excuses aside, I’m pleased to bring you this second installment in my Top 50 Albums of 2013 series. In case you missed Part 1, which covered #50-41, you absolutely should check that out here. Today’s set of ten albums covers a pretty good variety of genres, from garage rock to folk to electronica to funk, pop and post-rock. The main thing I’d say about these records? Almost all of them are really fun to listen to. So let’s get right on it, and join me after the jump for #40-31! This is the big one. 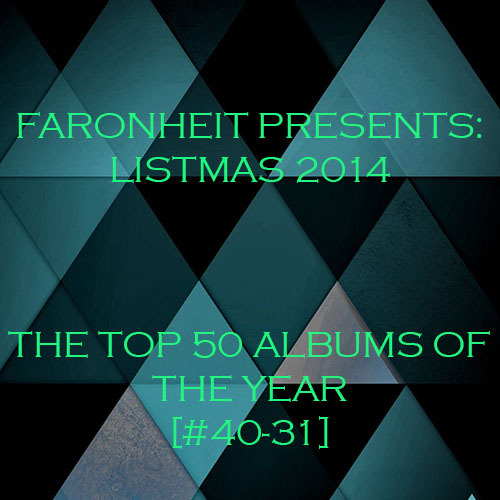 Welcome to Faronheit’s Top 50 Albums of 2013 countdown! Over the next few days, I’ll be revealing my unveiling the full list, 10 albums at a time. We do this every year, and it’s always an adventure. Things are running just a little bit behind schedule at the moment, as I’d hoped to have this up before Christmas, but I appreciate your patience and promise to have everything posted before the end of the year. 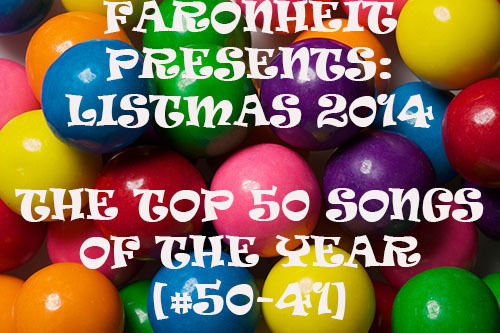 Did you happen to catch my Top 50 Songs of 2013 list from earlier this month? In case you missed it, all of those posts can be found simply by clicking this link. While I’m always excited to share tracks with you, as evidenced by the daily Pick Your Poison posts, albums hold a special place in my heart. This site was started with the intention of writing long form album reviews, and unfortunately in 2013 strayed further away from that than ever. A combination of factors, from having a really busy schedule to endless amounts of writing and rewriting to bouts of writer’s block prevented me from cranking out more than a few album reviews each month. It’s something I have a strong desire to get back to however, so that’s going to be a primary goal for 2014. As things stand now, all 50 of the albums in this countdown have short paragraph mini reviews to go along with them, so in a sense I’m packing a year’s worth into just a few entries. I hope you enjoy them, and maybe even discover some great records that you missed from this past year. Let’s get started then, shall we? Follow me after the jump for the first set of ten albums, with #50-41! A couple of quick stats about the songs featured below. It’s a 50-50 split between male and female vocalists. There is one hip hop track, two tracks by electronica artists, three tracks featuring guest vocalists (if you count David Bowie), and a wbole lot of incredibly addictive hooks. Now if you’ll join me after the jump, here are my 10 favorite songs that appeared on records released in 2013.